The mobile App developmentcompanies have come the long way in recent five years. The mobile app development technology is perpetually evolving and has increased its focus on the application analytics and its development. With so many iOS applications in the market, the competition is always at peak with iphone application development companies always pushing to get edge over their competitors. The amazing development that the mobile apps have gone through, it is imperative for one to keep an update on new mobile apps especially for the sake of one’s business. Just like last year saw the most amazing mobile app developments, this yea too we expect something just as if not more incredible improvement in the industry. The cloud technology has played a very crucial role in the past year and now cloud driven apps are expected to become more popular, especially due to the increase in the number of people using multiple mobile devices and wearable technologies. These apps will enable the cloud app developers to build apps that can be accessed on various devices without changing the functions, features or the data etc. Apple’s upcoming iwatch or apple watches is probably one of the most top things that are trending on the internet right now. As the time passes, only a few days remain for Apple to release the product most of us are anticipating. Although most of the information about the wearable technology is not known, the device is not a standalone device. 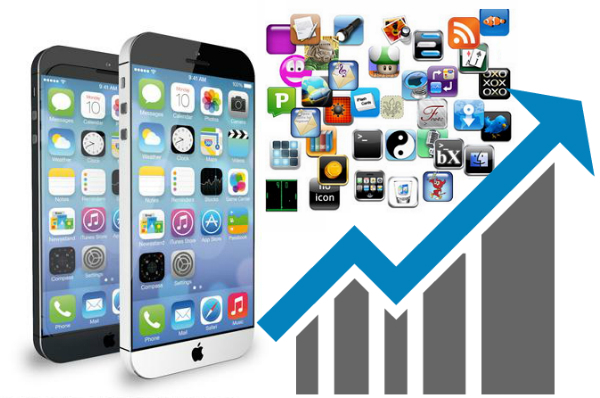 Iphone App development has always earned huge revenues. Thereby, saving a lot of time and effort that would be required for creating a standalone app. These are very effective for using for fitness and to keep a track of productivity. There are always various reports of hacks and information leaks, many reports suggest that many apps are created without any basic security measures. Therefore, this year we will definitely see app developers focusing on the security gaps that were detected in the past year. The internet of things apps are developing more and more by connecting multiple devices. With IoT technology the developers will be inspired on developing apps which focus on user experience on different devices. Customer engagement management platforms which are based on Beacon technology and WiFi will see more of breakthrough in this year. This type of tech is blurring the lines between online and offline in retail business. As apple has already integrated Beacon technology in its iOS, the trend is expected to follow this year. The Wifi technology is becoming more and more consumed and in this year it will be more than just a tool for internet access. For eg- there is a platform WiFi MX that gives the businesses an advantage for connecting with their customers through WiFi to access the local relevant services and content. successful iOS app programming to generate the revenue for his/her mobile application development firm. Smartphones have become an indispensable part of life. With the increased demand of smartphone usage is increasing demand for mobile enterprise application development. Among all the smartphone of the world, iPhone is considered the best dominating player in Australia & USA. Therefore, before developing apps for IOS devices, it is necessary to understand some of the aspects of IOS application development. First of all, Developers should keep in mind the usefulness and usability of applications. It is also essential to understand the advantage of having such applications for your businesses. The application represents a brand and its reputation for highly successful must be recommended to hire a professional iPhone application development company who provide some unique ideas that blends with the business objective. A professional iPhone application development company can efficiently understand the business requirements of their customers and transform into a working application. A professional iPhone Application developers use this technology to hook up the businesses. Today, Most of the user surf companies for fulfill their requirements via smartphone. For this, it is beneficial for their businesses to hire iPhone Application development services from one of the leading iPhone application development company. The app development for it takes less time and less money. Customers more willing to pay. Feel free to drop us an enquiry for your iPhone App development project on sales@auminfotech.co.in or Contact Us on +1-(209)-580-8102 or +91- 9712884486. Our business analyst will get in touch with you as soon as possible. iPhone 6 is the latest version of the smart device, iPhone, which has captured the attention of every gadget crazy geek out there. iOS, the operating system powering iPhone, has been upgraded to its 8th version to meet our changing needs. This one device can push your business growth and raise the profit figures in your P&L account. Let’s discover how. iPhone, the device invented by Apple, has become a coveted device for everyone across the world. It is used not only by individuals but also by businesses as a powerful marketing tool. Packed with powerful features, it meets the requirements of different class of users. There is no doubt that iPhone applications power the iPhone device. With more than 3,00,000 apps brimming in the App Store, the use of iPhone apps has quadrupled over the last few years. People are increasingly relying on these applications for performing all their tasks from setting time for meditation to giving that important presentation on time. Improved technology and tools for mobile application development have expanded the usefulness of these applications. Used as an important marketing tool, they help a business in establishing its stand as a business that transforms itself with changing times. Availing of iPhone application development services can help a business emerge ahead of its competitors. There are a number of ways in which iPhone application development can enhance your business value. Let’s have a look at some of them. An iPhone application created by professional iPhone application development company can help a business in expanding its customer base as a business reaches a new platform. By capturing the attention of prospective customers, an iPhone application also helps a business in retaining the interest of its existing client base. Utilizing iPhone application development in its marketing campaign, a business can power its advertising strategies. It paves the way for a business to reach customers in an innovative and technology oriented way. An iPhone app can change the way a business is perceived by its consumers. It presents a different picture of a business as an entity that has embraced improving technology. Simply put, it enhances its brand value. An iPhone application, created by an experienced mobile application development company, can help a business in generating revenue. A business can do this by allowing the user to use the app for a trial period. There are instances where some of some features of an application are provided in the paid version. A dynamic iPhone application development company can help you avail of an app that keeps users hooked to their devices and attract their attention. This can provide word-of-mouth publicity to the business, and can also spread business awareness. Given the increasing speed with which Apple is improving on its iOS, there will be an unquenchable demand both for unique, creative apps, and for iPhone application development services. So before the most experienced and dynamic mobile application development company gets busy with creating an iPhone application for your competitor, get into action to utilize the iPhone application development services from the best leaders in the market.